An outstanding ground cover plant, Correa ‘Lemon Twist’ has both attractive flowers and foliage. This is a low growing and speeding shrub, the flowers attract birds and bees to the garden in winter to spring, and the rounded foliage is attractive year round. It is very easy care and looks great in rock garden or in the general garden border. Like all Correa a sunny position and a well drained soil are essential. Mulch around the plant to help maintain a cool moist root run. Light pruning in early spring will help keep the plant a little more compact if required. A well drained soil is essential. If growing in containers a specialist native plant potting mix is recommended. 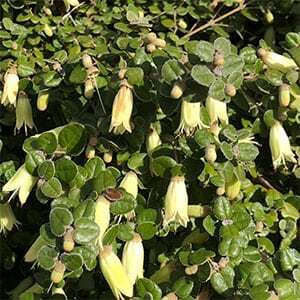 Botanical Name – Correa reflexa x alba ‘Lemon Twist. Spread – Forms a clump to around 1 metre.